I was 23 when I gave birth to my first baby. At the time, none of my friends (well, a few) had babies. Tom and I had been married for almost 2 years by the time our daughter was born and he was working 3rd shift (11pm-7am.) These were some of the hardest times of my life. All day was spent cooped up with a baby, seeing Facebook photos of all my friends in bikinis on boats with beer in their hands. Tom slept during the day, woke up to eat dinner with us and then left for work around 10pm. This meant 5 hours of “help” with a baby which really meant I made dinner and cleaned the house for the day. The night shift was all mine; help wasn’t even an option. Just typing it causes knots to form in my stomach. I had never been more stressed out in my life and I didn’t know what to do. Now looking back, I can see my minimalism journey beginning. Some of the strategies I implemented help keep my crazy life and schedule just al little less hectic. I had no idea I was becoming a minimalist mom, but it as happening. 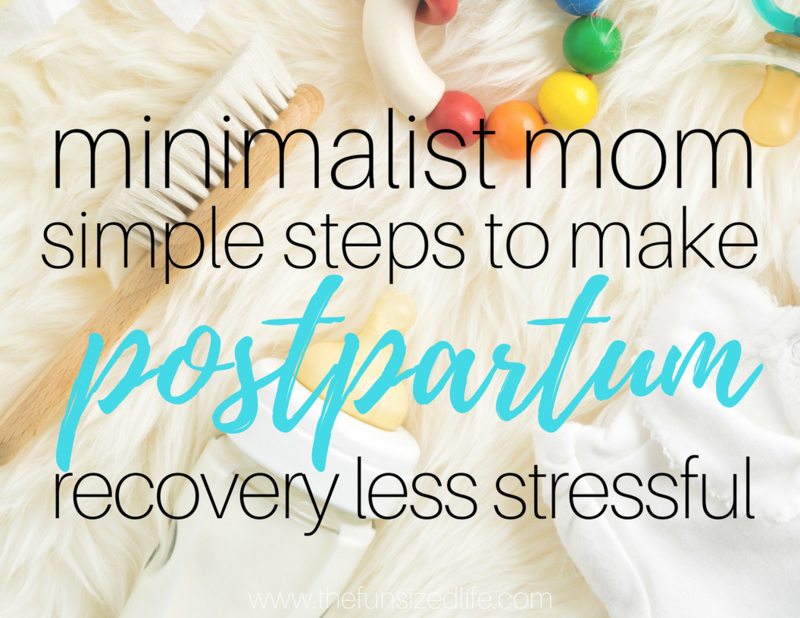 So let me share with you those simple steps to make postpartum recovery less stressful. Ya heard me. You brain will be foggy, your body will be tired, but please remember that whatever the hospital brings into your room for you and your baby are yours. Bring them home. Extra diapers, wipes, pads…make out with all that you can! Don’t feel guilty, you’re really paying for it all. Bringing these extra things home can be the difference between extra trips to the store or middle of the night panics of not having everything you need. Make sure you plan ahead before baby makes an appearance, but also, be smart and take all that you can to ensure that you will be more than taken care of once you get home. Also look into apps like Ibotta and Dosh to help you earn some of your money back on your baby purchases! (I mean, the woman has had 4 kids and she looks better than I ever have.) The belly wrap helps get your uterus and tummy back into shape, which is something the doctors and nurses will make you aware of anyway. I personally was terrified of what my post-baby belly would look like. While I don’t recommend panicking about your body after baby (like I did) I do recommend taking small steps to help it recover quickly and smoothly. Investing in a belly wrap is also a good idea to help your piece of mind. Recovery takes time and your body is going to need a while to get back to it’s normal state. A belly wrap can be a great reminder that you are doing all that you can without actually having to do anything more than take care of yourself and your baby. Don’t worry about getting back to the gym or fitting in at-home workouts. Wrap that tum and carry on with your day. Don’t add anything extra to your plate. Creating and caring for a new human is already one of the most exhausting tasks you will ever do. Again, because I was (almost) one of the first of my friends to have a baby, one thing I heard frequently was that you could barely tell kids lived in my house. Maybe that sounds absolutely terrible. Trust me, they trashed the place. I even let my kids have one cupboard that was always “on limits” to them. They could take out all the tupperware, bang it around, play with it, throw it and learn from it all they wanted to. The reason I so often heard this comment was because I found clever ways to hide all of the clutter in plain site. A few cute baskets is all you need. My latest favorite is our coffee table ottoman that opens up for additional storage. These are things you can easily prep for while you’re pregnant. I had diaper stations set up in my room, the baby’s room and the living room and all were neatly hidden away. Toys, pacifiers (which they never actually used) and burping clothes all had their place in our house and you probably wouldn’t even know it. The reason I did this is because, for me, seeing the clutter would cause my stress levels to rise. It made me feel defeated, when chances are, I already felt that way without the clutter. Not only this, but it also made for easy de-cluttering at the end of the day or before company came over. So, if you’re like me, and get mild panic attacks just imagining your home being taken over by trinkets, toys and diapers, then check out some of these simple, easy storage solutions. They will keep your home adorable and help you hide the chaos. Like all new moms, I originally imagined how perfect I would be as a mom. My baby and I would snuggle quietly in the morning sunshine, with my flat tummy tightly resting under my hip hugging jeans that I had the energy to put on. I wouldn’t yell. I would be glowing all the time and just the sound of my voice would instantly soothe my child to sleep. Then reality hit. My daughter was a “tough” baby. She cried all the time and never sat still. I was constantly kicked, climbed on, cried at and spit up on. And that was just the first 2 weeks. Not only that but, I felt obligated to always keep her from crying as to not wake our oldest daughter (who I helped my husband raise from the age of 5.) On top of having no friends to talk to, I also had a husband who was either working or sleeping. The only “social interaction” or “adult contact” I got was from Facebook, which I guess panned out for me now that my job basically circles around social media. Being unhappy –don’t feel guilty for not being a ray of sunshine…like you imagined you would be. It is OK to be unhappy when you are a new mom. Just pay attention if you start to become depressed. I personally believe I struggled with postpartum depression and was just too scared to say anything. Let baby cry. –If you have fed, changed and done everything you can to try to soothe your babe it’s ok to give yourself a break. I never did. My daughter cried all the time and all day I tried to please her. It was hard sometimes to put a pillow over my head and force myself to sleep but I was a better mom when I woke up. Let people help you. –Do yourself a favor and anytime anyone offers their help…just take it. They want to come over so you can shower…do it. They want to bring you food…yes, please! It doesn’t mean you are weak. It means you’re human and you have someone who wants to give you a time out. You are not failing. There is a huge difference between learning and failing. If you make a mistake, it’s ok. Learn from it. You are not a failure as a parent. You are only human. If you feel like you might be battling postpartum depression, be sure to consult your primary care physician. It’s normal, you won’t be judged. They want to help you. It’s ok to be unhappy at times, but it’s important to seek help when it starts to consume your life. I have a friend who struggled with very bad postpartum and she shares a lot about her journey on her blog, Delicate Change. If you feel like your struggles are worse than they should be, I encourage you to read up on your symptoms and seek help if necessary. There are also hotlines to help if you are nervous speaking face to face with someone. I have linked to some below. Remember always to just breath. If you day was hard just remember, “this too shall pass.” You got this mama.